Field duck hunting with Mid-America Hunting Association is over cut crop stubble fields or winter wheat on private farm land where crops are grown to be harvested as an agricultural commodity for sale of that grain. We do not plant dry land fields specifically for the purpose of field duck hunting. Field duck hunting includes a variety of water with adjoining crop fields and dry sets away from water. These water bodies are typically farm ponds and watershed lakes. The Association provides the private land access, telephone reservations to that land separating hunters, recommendations where to scout and a local lodging listing. A big plus compared to the common approach of finding the latest platt book and door knocking hoping to find someone that may allow access. Temporary or portable blinds only, dogs and decoys are provided by and set by the Association unguided hunter. ATV field access is subsumed in the reservation on cut crop stubble fields only. No ATV access or any other vehicle is permitted on winter (green) wheat fields. Winter wheat fields if wanting to hunt them will require foot placement of all spreads and blinds and then so only when dry or frozen. The single advantage unique to our approach to self guided field hunts is our amount of acreage amounting to over tens of thousands of acres.This allows the hunter to scout out where the ducks are and set up in a near by field. As the season progresses this advantage shows itself well by being able to hunt ducks well away the more heavily pressured waterfowl refuges. What is legal – just so we all agree about the field duck hunting we allow. Hunt in fields of unharvested standing crops. Hunt over standing crops that have been flooded. Hunt over grain in a field that was scattered only as the result of a normal harvesting. No one is permitted to bring into any field any grain above that which is in that field resulting from standard farming practices. Set ups can be for that day or the next morning. Field sets may be left in place for as long as that hunter keeps his reservation up to date for that field. Each hunter may have more than one field duck hunting spot active on any given day. In that field the hunter decides where on the available acreage to place decoys and blinds. Field waterfowl hunts are for both ducks and goose sets with the emphasis of this article on field duck hunting. Any decoy legal by federal and state waterfowl regulations may be employed. All blinds and decoys must be removed at the end of that reservation. Contrast this to having a single duck lease somewhere and hope the ducks show up. The difference is flexibility of location. This combine with flexibility of when and how often to hunt as within this organization no hunter is limited more than by federal and state waterfowl regulations making for about the greatest opportunity possible for successful unguided field duck hunting. Results from the end of regular duck season on one of the coldest winters in a long time. 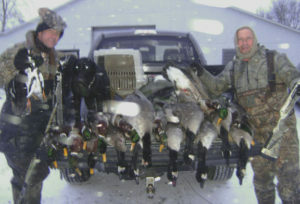 This hunt was after the wetlands froze. 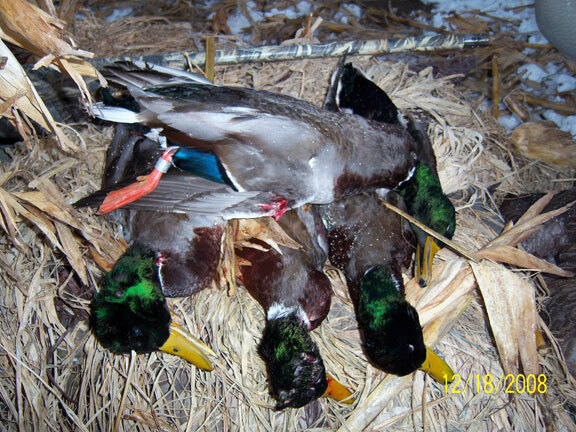 A Kansas pond duck hunt in combination with a field set. The bonus was a band. The corn is a giveaway this was a “Central Lowlands” hunt or that region of southern Iowa, eastern Kansas and north Missouri. The lack of snow cover shows this an early season hunt. 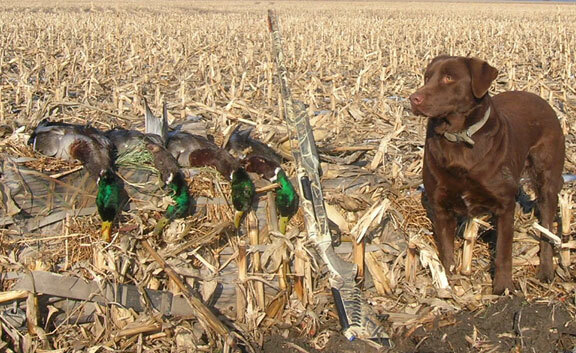 Have a look at some maps that shows the Central Lowlands of Iowa, Missouri and Kansas that has the region of the most surface water and waterfowl attracting corn stubble. The time stamp shows well the more common late season hunts. A duck band as a bonus. Mid-America Hunting Association has been around since 1965. The owner has committed to continue the Association until 2024. After that it will be someone else’s challenge. Al and Bob in the picture above (Kevin out of frame) told how they “…froze more than usual…”. This hunting buddy group are some of the toughest hunters in the Association. The wind driven falling snow in the picture is just one clue it was a hard day to hunt.